Spring break is coming up for a lot of people and it will be nice to get away for a few days, unplug and relax! Wouldn't it be great to bring that feeling back home? I recently finished a great e-living room board for a client who has some great memories as a child, and still loves taking vacations to the beach but didn't live anywhere near one. How do you take inspiration like the beach but not go full blown theme? I like to do it through mood and color. Now there are a couple literal translations here...the sunburst mirror and white sea urchin from Nate Berkus but when you look at this room it doesn't scream I have a beach themed living room. Yet, you still get the feeling of the beach and feel relaxed each time you walk into the room. Thanks C.T. for the opportunity to bring your vacation, home! Great design, Annie! 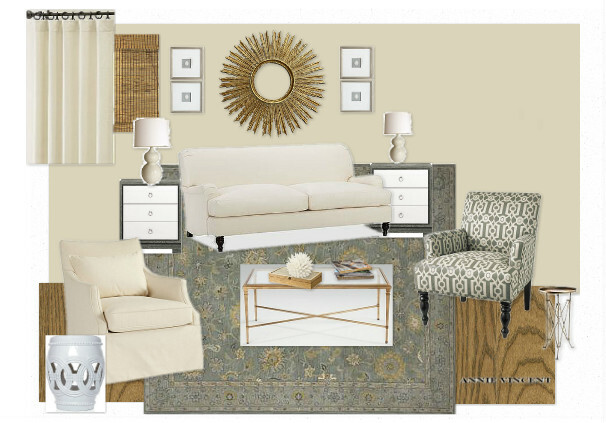 I love a neutral room. The hint of blue is just right for a beachy feel! Thanks Sita. I really appreciate your comments!